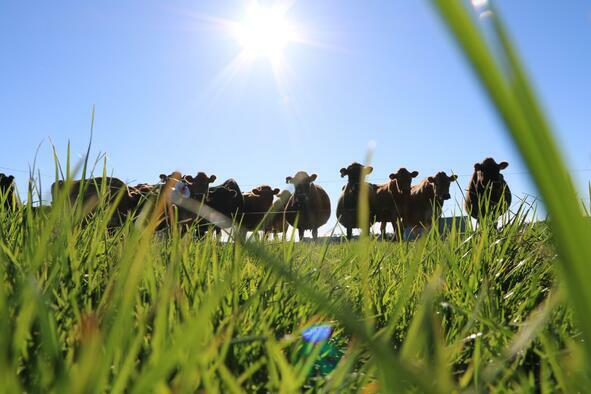 Spring may seem a long way off, but it's important to ensure you allow enough time to prepare your herd for the transition to grazing. Howard Straub III, dairy manager with the W.K. Kellogg Biological Station, Pasture Dairy Center at Michigan State University (MSU), offers these tips to help your herd adapt to the new diet. Check all your fences for needed maintenance. If you have water tanks and connections, remember to check them as well. Grade lanes if needed. Grease gates and your Lely Grazeway where applicable. Having all this done before the transition will lead to fewer problems once the herd starts grazing. Do as much herd health as possible before starting the transition. Catch up on your vaccinations and have the hoof trimmer come in to fix any mobility issues. We are going to be asking these cows to get their own meal; the least we can do is make sure they are not in pain while doing it. Start your transition as early as the pasture will allow. It is important to get a start building the feed “wedge,” a key tool for managing feed on a pasture based dairy farm, representing the quality and quantity of forage dry matter available both now and during grazing.The first pastures that are used may not be fully flush and ideal, but the cows will not be in them long, either. We call this flash grazing. Transition cows to pasture slowly. This will help the cows’ ruman microbes transition to the new feed stock. At MSU, the first day out on grass is two hours long. The second day is four hours, and so on until the sixth day when they are grazing half days. The cows are retrieved from the pasture after each of these time periods end. On day 10, set the Grazeway for 12 hour access, but do not go get the cows. On day 14, the Grazeways are functioning 24 hours a day (fully grazing). While this schedule can be somewhat flexible, recommendations are to take no less than 10 days to fully transition to grass. Always introduce pasture to cows after they have been fed. This will reduce the amount of grass that is initially ingested and reduce instances of bloat. Cows should feed two hours before the transition grazing events in order to give them plenty of time to fill up. As the transition continues, there will be a reduction in a partial TMR (pTMR) feed intake. You can reduce the amount offered to control weigh backs, but don’t short the cows on feed offered. They will reduce it on their own time. Use the Grazeways as much as possible during this transition. While most of the cows will remember how to use the selection gates, you may have some new heifers that have never used them. The more they go through them the better. Keep an eye on your Grazeways and one-way gates to assist any heifers that may seem confused. Delaying use of the Grazeways during transition will delay the training, and you may be pushing and fetching heifers for a month. Preparing your herd now will help ensure a smooth transition and keep your herd healthy and productive throughout the grazing season. 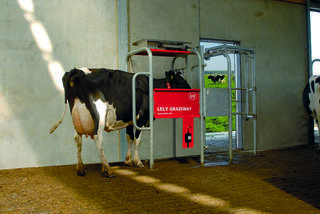 Learn more about the Lely Grazeway selection box, an essential tool grazing. Cows choose when they want to go out to pasture. The Grazeway then determines whether or not they can, using the Lely Qwes cow-recognition system.